We noted before how Batista appeared on the Chasing Glory with Lilian Garcia podcast prior to his WrestleMania match against the Game Triple H.
During the interview, he had explained why he chose Triple H as his final opponent and also revealed that he had turned down a previous Hall Of Fame induction. 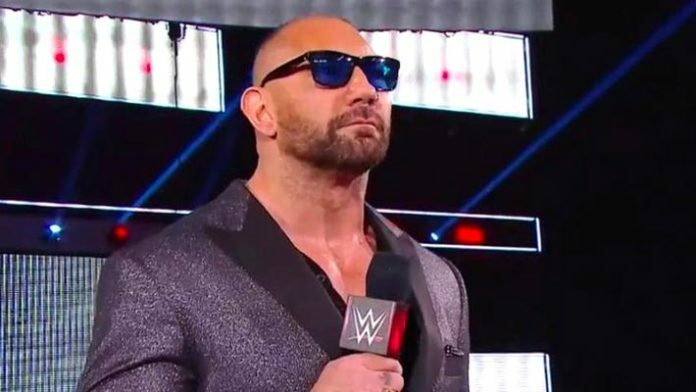 Batista first claimed that he has already asked someone to induct him into the Hall Of Fame when the time comes, though he didn’t reveal the name of the person. Continuing on the topic, the former World Champion revealed that Mr. McMahon had talked to him about an induction years ago, but he had declined. According to him, he declined an induction because he didn’t have closure on his career and he will go into the Hall Of Fame when he is ready to hang up his boots. As we noted before, the former World Champion lost to Triple H in a No Holds Barred Match at WrestleMania and the WWE COO was able to beat him with some help from Ric Flair. After the match, Batista officially confirmed his retirement from the world of professional wrestling saying that he is grateful for every second of this amazing journey. Taking his comments about an induction into consideration, the big question is if we can see the Hollywood Star finally being inducted next year and headlining the Hall of Fame class of 2020?